So you enjoy working with kids, like to be outdoors and are wondering what you can do this summer for work? Well, maybe a camp job is worth considering since summer camps hire thousands of teens and older students each summer to work as counselors, staff-in-training, activity specialists, kitchen staff, office workers, and groundskeepers. Although jobs are abundant, an effective job search campaign is essential to find the right position. Here are some tips to help you land a fun camp job this summer. For counselor and activity specialist positions get some experience working with children. Babysitting, tutoring, volunteering with after-school programs, assisting coaches for kids teams, helping drama/dance/music teachers, assisting scout leaders or acting as a Big Brother/Big Sister are all examples of viable experience. Ask guidance counselors, clergy, coaches, teachers or college volunteer coordinators for suggestions. Camps are often run by teachers and coaches so ask your favorites for ideas about jobs. If you have impressed them, they may hire you or refer you for a job. If you have attended a camp or recreation program as a younger kid, consider contacting the director as "one of their own." If you are under 17, inquire about counselor-in-training positions or support jobs in the kitchen, landscaping, or the office. 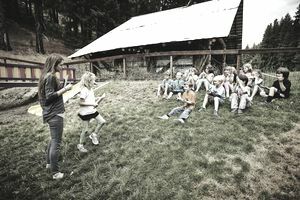 Most camps require counselors to be 17 or 18 years old. However, some camp jobs may be available for 16-year-olds or younger (depending on hiring policy and state labor laws). Check the camp's​ job application and hiring information for details. For those targeting specialist positions, make sure you gain certifications or secure references which attest to your competence in swimming/aquatics, art, drama, sports, technology, horseback riding, climbing, etc. Define the types of camps you would like to target including overnight or day, special needs or special focus like environmental, adventure, art, music, sports, academic, etc. Some camps are specialized. For psychology, social work, education or health-related majors consider working at a camp for those with special needs like weight loss, asthma, learning disabilities, cancer or emotional challenges. Search a variety of websites which list summer camp jobs like CampJobs, CampChannel, CampPage, and CampDepot. Also, review some of the summer jobs sites like Cool Works for interesting listings. Use the same sites to identify camps and then apply online or contact camp directors to inquire about jobs. Not all camps will post jobs on the sites referenced above but all will hire young people for summer jobs so you will want to reach out directly to any camps where you would really like to work. Contact local YMCA's and other youth organizations since many will run summer day and/or overnight camps. If you prefer a local day job, contact your town and/or county recreation department to ask about positions with their summer programs. Make sure that you are well prepared for interviews and follow some of the tips above and you will be well on your way to a satisfying summer camp job.